Barrington, Rhode Island Fire Department- voters approved the hiring of 4 additional firefighters that will bring the staffing total to 29. Central Coventry, Rhode Island Fire Department- Fire Chief Peter J. Lamb has left his post to persue other career opportunities. Central Coventry, Rhode Island Fire Department- is selling the Harris Fire Station which closed in 2013. CLICK FOR ARTICLE. Central Coventry, Rhode Island Fire Department- has named Hopkins Hill Fire Chief Frank Brown as the new Central Coventry Fire Chief. He will be Fire Chief for both departments. Central Coventry, Rhode Island Fire Department- swears in 10 new firefighters. CLICK FOR ARTICLE. Cranston, Rhode Island Fire Department- the 2001 ex U.S. Navy Pierce Contender has been lettered and is running as Engine 8. Cranston, Rhode Island Fire Department- has hired 16 new firefighters, including the department's first female firefighter. Exeter, Rhode Island Fire Department– has been awarded a Federal grant in the amount of $80,953 for Hose. Foster Ambulance Corps, Foster, Rhode Island- has received a Federal grant in the amount of $83,810 for 2 – Cardiac Monitors. Harmony Fire Dist (Gloucester, RI)- has named Captain Richard A. Waterman as the new Fire Chief. Kingston, Rhode Island– has been awarded a Federal grant in the amount of 168, 100 to implement a Recruitment and Retention Program for Volunteer Firefighters. Lime Rock, Rhode Island Fire Department has been awarded a Federal grant in the amount of $38,667 for 4 – Thermal Imaging Cameras. Lime Rock Fire District, Lincoln, Rhode Island- has been awarded a Regional Federal grant in the amount of $388,667 for Radio Equipment for 6 Fire and EMS Departments. Lincoln, Rhode Island Fire Departments receive $650,000 in Federal funding. CLICK FOR ARTICLE. Middletown, Rhode Island Fire Department- Fire Chief Ronald Doire will retire in July after 35 years of service. Middletown, Rhode Island Fire Department- has appointed Peter Faerber Jr as the new Fire Chief. Narragansett, Rhode Island Fire Department- has received two State Homeland Security grants totaling $44,012. The funds will be utilized to fund a full-scale active shooter exercise, a position within Narragansett's Emergency Management Agency and the purchase of a trailer, which will be used as a point of distribution for the town's Medical Emergency Distribution System. Newport, Rhode Island Fire Department- city councilors postphone decision on new fireboat. CLICK FOR ARTICLE. Newport, Rhode Island Fire Department- Brian Dugan has been appointed as the new Fire Chief. North Kingstown, Rhode Island Fire Department- antique fire engine returns home. CLICK FOR ARTICLE. North Kingstown, Rhode Island Fire Department- has been awarded a Federal grant in the amount of $1,540,258 to hire 9 new firefighters. 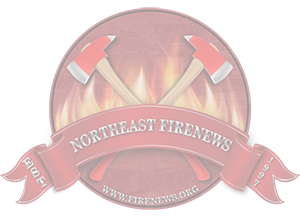 North Kingstown, Rhode Island Fire Department- Fire Chief pushes for Quonset Point fire station. CLICK FOR ARTICLE. North Providence, Rhode Island Fire Department- Battalion Chief Of Training and Safety John Silva was sworn in 5-Jan-2017 as the Assistant Chief of Department. Silva is a 27 year veteran of the Department. Chief Silva's son Mark was recently sworn in to the Portsmouth and his father John Sr. (Deceased) was a retired Lieutenant from North Providence. North Providence, Rhode Island Fire Department has been awarded a Federal grant in the amount of $168,728 for Chest Compression Devices and Automatic Defibrillators. North Scituate, Rhode Island Fire Department– has received a Federal grant in the amount of $30,726 for 1 – Cardiac Monitor. Pawtucket, Rhode Island Fire Department- two civilians injured after their vehicle slams into fire station. CLICK FOR ARTICLE. Pawtucket, Rhode Island Fire Department- Station 1 closing temporarily for repairs. CLICK FOR ARTICLE. Pawtucket, Rhode Island Fire Department- has been awarded a Federal grant in the amount of $2,448,938 to hire 13 new firefighters. Portsmouth, Rhode Island Fire Department- Deputy Chief Michael O'Brien has left his post with the department to be an inspector with the state fire marshal's office. Providence, Rhode Island Fire Department- 2 stations to close, 100 firefighters to be hired in deal to return department to 4 platoon system. CLICK FOR ARTICLE. Engine 4, Engine 5 and Ladder 4 have been disbanded. Providence, Rhode Island Fire Department- poised to train 80 new recruits. CLICK FOR ARTICLE. Providence, Rhode Island Fire Department- welcomes 83 new firefighters. CLICK FOR ARTICLE. Prudence Island, Rhode Island Fire Department- has been awarded a Federal grant in the amount of $42,906 for a Cardiac Monitor. Rhode Island- bill seeks funding for fireboat maintenance. CLICK FOR ARTICLE. Rhode Island Fire Academy- opens new training facility in Exeter. CLICK FOR ARTICLE. Rhode Island Fire Marshal- State Fire Marshal John Chartier has retired as of June 30th. James B. Gumbley has been named as acting Fire Marshal until a permenanent Fire Marshal is selected. Smithfield, Rhode Island Fire Department has been awarded a Regional Federal grant in the amount of $203,500 for a Firefighter Accountability System for 7 - Fire departments. Tiverton, Rhode Island Fire Department- Engine 3 involved in MVA. CLICK FOR ARTICLE. Warren, Rhode Island Fire Department- Fire Chief Al Galinelli will retire on October 27 after 29 years of service. Warren, Rhode Island Fire Department- has named James Sousa as the new fire chief. Warwick, Rhode Island Fire Department- finance committee denies apparatus request. CLICK FOR ARTICLE. Warwick, Rhode Island Fire Department- has appointed Marcel B. Fontenault Jr. as Assistant Chief. Westerly, Rhode Island Fire District- funds have been approved to order a new ladder truck from E-One. Western Coventry, Rhode Island Fire District- has appointed longtime firefighter James Cady as the department's first full-time fire chief. Woonsocket, Rhode Island Fire Department has been awarded a Federal grant in the amount of $377,055 for 54 - Firefighter Breathing Apparatus, Air Compressor / Refill System, Rapid Intervention Packs and Accountability System. Woonsocket, Rhode Island Fire Department- has been awarded a $1.5 Million Dollar Federal grant to hire 12 additional firefighters.